Astrakhan (serial number 701) is a Project 21630 Buyan river/sea-type corvette designed to reinforce Caspian Flotilla in littoral sea zone and rivers. The ship was laid down on January 30, 2004 at JSC Almaz Shipyard (St. Petersburg) and launched on October 7, 2005. Commissioned on September 1, 2006. 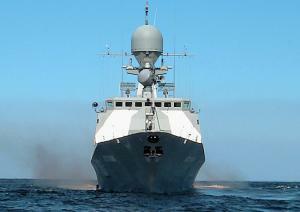 Since 2006, the ship takes part in all exercises and firing drills held by Caspian Flotilla. She is one of the most up-to-date and combat-worthy ships in the flotilla.